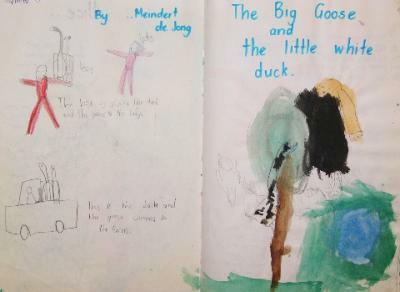 The Big Goose and the Little White Duck, by Meindert de Jong is one of our all time favourite books and all of Meindert de Jong's books are wonderful read alouds!! I also liked it when there were one hundred ducks. They were in a chicken coop and the big boy forgot to close the gate, and so, 100 ducks went down to the pond and swam in the pond. The goose called and called for the mother, Grandpa and the big boy. The boy found the goose and the 100 ducks and told the goose to put the ducks back in the chicken coop at night time. "Are you just laughing at me?" "Are you just laughing at me?" I think he wasn't. I think he was saying, "Why are you in the pond? You're just sitting there and I think you should be out." The Goose helped the Grandpa get out of it because Grandpa tried to pull the goose down and then he could pull his own feet out, step by step, out of the water. "Oh, Oh!, " because he was going to kill him, take out his feathers and roast him in the roasting pan. Well, he didn't! He went into the cowshed, got some water, brought it to where the bath was and gave Goosie a bigger bath so he could have room to splash around in. He liked his bath. The mother and the big boy said, "Can we keep the Goose forever and ever?" and the Grandpa said, "Yes!"